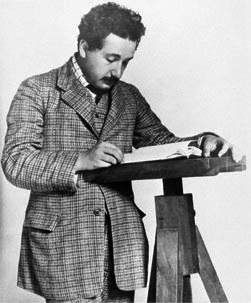 The following letter was written by Albert Einstein’s father. Please forgive a father who is so bold as to turn to you, esteemed Herr Professor, in the interest of his son. I shall start by telling you that my son Albert is 22 years old, that … he feels profoundly unhappy with his present lack of position, and his idea that he has gone off the tracks with his career & is now out of touch gets more and more entrenched each day. In addition, he is oppressed by the thought that he is a burden on us, people of modest means…. I have taken the liberty of turning [to you] with the humble request to … write him, if possible, a few words of encouragement, so that he might recover his joy in living and working. If, in addition, you could secure him an Assistant’s position for now or the next autumn, my gratitude would know no bounds…. I am also taking the liberty of mentioning that my son does not know anything about my unusual step.